This time of year is filled with many celebrations, visits from loved ones and reflections of the year’s most precious memories. However, quite often our holiday spirit is shattered by the recklessness of a drunk driver. According to the National Highway Traffic Safety Administration, 760 people died as a result of drunken driving-related crashes in America during December 2011. Furthermore, in the European Union, studies by the Global Burden of Disease of the World Health Organization state that more than one in three traffic fatalities are due to alcohol. 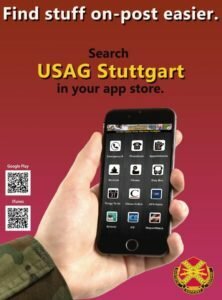 The U.S. Army Garrison Stuttgart Army Substance Abuse Program would like to encourage community members to take some extra steps to ensure that they remain healthy and happy through the holidays. • Choose a sober driver before you go out. Have a plan that includes a responsible driver to get you home safely. • Be responsible. Never consume more than one standard drink in an hour, and plan to have no more than three drinks at the event. One standard drink is 1.5 ounces of 80 proof liquor, five ounces of wine, or 12 ounces of beer. • Call a taxi. If your designated driver fails at remaining sober, take alternate transportation. Anything is better than getting in the vehicle with a drunk or buzzed driver. • Offer non-alcoholic beverages. There are plenty of fancy “mocktails” that will serve the visual purpose without the spirited consequences. Start a new trend and set the example for others to follow. Not all parties need alcohol to be fun. • Serve plenty of food. If there are alcoholic beverages served, remember that filling up on a great meal or plenty of appetizers will slow the rate of alcohol absorption. • Stop serving alcohol before the party ends. Give at least an hour and a half to two hours without alcohol before the guests start to leave. • Arrange alternate transportation or hide keys. Pay attention to your guests. Be responsible and call a taxi, arrange for a sober driver, or allow them to sleep it off at your place. • Remember that “buzzed driving is drunk driving.” The holidays should be a time for celebration, not tragedy. Help to make Stuttgart’s roadways safer by never driving after drinking.